Vicki and Les are in Ottawa on their way to Arctic Bay some distance in the Arctic Circle, to have a Bible week with the Church there. 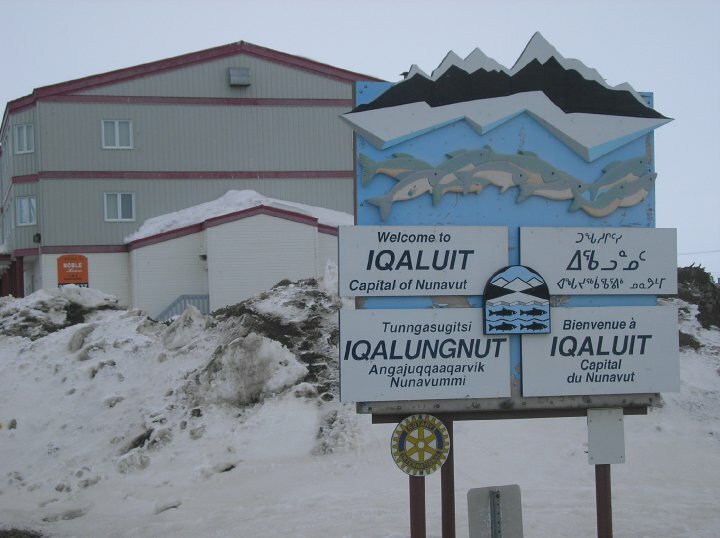 They will be there for 2 ½ weeks and travel to three locations: Arctic Bay, Iqaluit, and Cape Dorset. They are taking their thick coats with gloves, scarves and Russian hats against the minus 15 degrees of the summer there. Temperatures will rise to near zero. Then they travel down to friends near Toronto for a week and then back to the UK at the end of May. Please pray it will be a significant visit for the believers there. More from Singapore and a photo! Les and Vicki are in Singapore during some of Febrary and March. The first week of ministry was with Tung Ling Bible School where Les taught for four hours a day on the book of Romans and New Testament Survey. 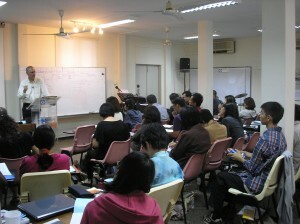 Around 75 students from SE Asia were enrolled on this 3 month School of Ministry. Les is also conducting seminars with the Marketplace Bible Institute on the Letter to the Hebrews. We have now been in Singapore for one week. I have been teaching about 70 students in the Tung Ling Bible school, and the students were lively engaging and wonderful to be with. I came away from it feeling blessed and encouraged by the hunger and enthusiasm for God’s word. Thanks Tung Ling students and faculty for a great week! 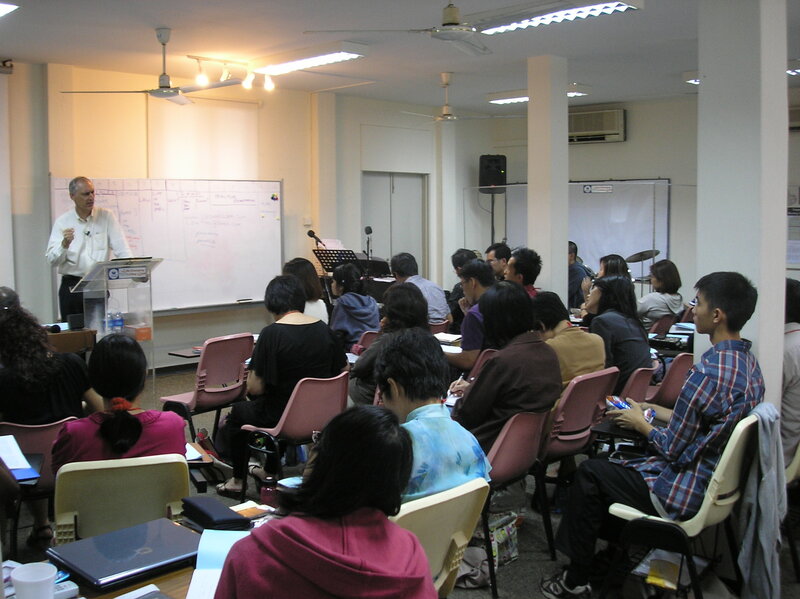 We will be in Singapore for another two weeks holding a seminar on Hebrews and preaching in three more Churches. We have many friends here and it is a second home. Its also great to be in the warmth after the cold of Siberia! This is the beginning of my fourth week in Russia, and my third week in Siberia. I have been travelling thousands of kilometers by train, and air. It took 40 hours from Omsk to Irkutsk on 23/24th January. Before anyone thinks I did it for the sheer punishment, the fact is that internal flights in Russia are irregular and expensive. To do the same trip by air would have cost about 600 dollars and would have been routed back through Moscow, making it a long and expensive flight. The train itself cost 200 dollars, which the Church here paid for. The Churches are vibrant and full of hungry Christians eager to know more about the Lord and His Word. On some of the meetings there has been a fragrant spirit of revelation and a sense of God’s powerful moving. On some occasions I have felt drained and a little dry, in need of spiritual refreshment. The Lord is faithful and His friendship so matchless and sustaining. The days are spent with groups of 30-40 ministers or Bible students, sharing truths from Galatians, Romans, the work of the Holy Spirit and life in Christ. There are always special moments during these series when hearts grow still and there is a deep work done in many lives. It is very humbling to be a part of this great work even if it is for such a short time. Thanks to all who pray. The weather has been mild this week around minus seven, but things are set to get colder this week as we travel again another 12 hours from Kansk to Bratsk on Sunday afternoon 6th Feb. Larry Hill will join me there for two weeks and will take a big load of the ministry. That will be a special treat. I have been in Russia now for a week, having had a wonderful week of ministry with a precious Church in Sochi on the Black Sea. Each day I sat with the leaders for a few hours and we shared around the scriptures. I have hardly ever seen such hunger to go deeper with God and such spiritual honesty and humility. Moreover these are mature men who have been leaders for many years. Then in the evenings I shared the word with a congregation of several hundred, who wept and rejoiced and responded as the word was preached. My translator there was a close friend called Nick Markin who put all his heart into the matter. It was a great time and as often happens they have begged for another longer visit as soon as possible. I flew last night (Sunday 16th Jan) from Sochi to Omsk via Moscow. Sochi was plus 10 degrees, while Omsk is minus 20. The brothers here all say it is so mild!!! I arrived and went straight into teaching a group of about 25 believers in a Bible school here. It is so inspiring to be with them and to share for a week about the life of Jesus. On Friday we take the trans Siberian railway east to Irkutsk, a journey which will take about 40 hours. God is doing a great work in Russia. Personality profiling: Which king are you? Every man and woman was created to reign as Kings and Priests with Jesus. The gospel restores this great calling in the life of the believer. The lives of the Kings of Israel and Judah teach us how this is possible. Here we see the whole spectrum of human personality from the cleverest man who ever lived to the most evil dictator, from the man who was too nice to ever say “no” to the man who seemed to lack every trace of conscience. Come and look in the mirror of scripture and find God’s answer to every problem of human personality. The anatomy of moral failure. The blueprint of spiritual success. Human personality: Its pitfalls (depression, anger, ambition) and its capacity to bear authority as Kings in the image of God. Jesus the King of Kings; our example, and the perfect King. 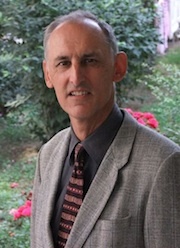 There are several other repositories of Les’ preaching around the Internet, you might want to take a look, particularly if you are a non English speaker. Please pray for good health, God’s hand over all the travelling and power in the preaching. Pictures from Les and Vicki’s trip to Baffin Island can be found here. 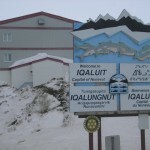 Many thanks for those who prayed for them during their time with with Faith Turner, as she took them to the Arctic Bay, Pond Inlet and Cape Dorset communities.